In what coach Garnett Ferron called a “well-deserved victory,” the Panthers beat the Rebels 3-1 late Sunday afternoon at the A. O. Shirley Grounds, to collect their first BVI Football Association Men’s League win. 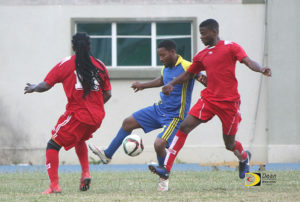 “I credit this victory to the system of play that I’ve implemented over the past couple of weeks,” Ferron said, after they opening play with a 1-1 draw against Virgin Gorda United, then had last week’s game against One cancelled because of a lack of officials to call the match. The Panthers’ Shannon Lawrence opened the scoring in the 53rd minute, after both teams played to a 0-0 half. Lawrence beat the Rebels’ goalie, who rushed towards the ball to block it, but tripped behind one of his players and fell. Prevell Asson increased the lead in to 2-0, in the 72nd after getting a feed from a winger, before the Rebels’ Michael Baptichon scored from a penalty shot, just outside the 20 yards box, cutting the deficit to 2-1, in the 73rd. Wayne Phillip sealed the Panther’s scoring with his legger in the 81st minute. Ferron said he’s going to reinforce the basics of the V attack, spreading going forward and when coming back. He wants to see all his players in the V and forcing their opponents out. “About 90% of goals score from down the middle so we want to push them outside and reduce shots to our goal,” he explained. In matches on Virgin Gorda, the Wolues raced to a 3-0 halftime lead en route to beating Old Madrid 6-1, for their first victory. Phillip Nelson opened the scoring in the 11th minute and then a brace from Mark Gardner in the 33rd and 37th minutes carried them into halftime with a comfortable lead. Old Madrid’s veteran Kenmore Peters cut the deficit in the 45th minute before Christopher Farmer and Christopher Smith put the result beyond doubt, scoring in the 60th and 82nd minutes respectively. Nelson would then add his second goal 87 minutes in to put the icing on the cake and made it 6-1. In the other game, Carl Stewart hat trick in helping One Love improve to 2-0 with a 5-1 victory over F.C. Sea Argo. Richard Morgan scored from a penalty in the 11th minute, giving One Love the early lead. Joel Fernandez equalized for F.C. Sea Ago in the 21st before Stewart scored his first goal in the 38th minute for a 2-1 half time edge.